Im sad to announce that my good friend David Hiscock, who was apart of Beat Fm and Family has passed away today the 25th April 2009. In his honour I am welcoming friends to join me with his friends to the Taxi Club at 10.15Pm tonight for a honour show and rememberece for his presence in our Glbt Community. This show will also be played on Thursday Night at the Clarence Hotel on the 02nd Thursday of May. Davids love as a Dj for many a decades was music, and has worked, attended and supported myself for years. He will be sadly missed, loved and have a special place in my heart for ever. Ohh dear, Its hard to believe that all I need to do is send in some identification to prove that Im human. How wonderful darlings. So I am now emailing off my licence to them so they can prove that I am a boy in a frock that perhaps sang on a rock. 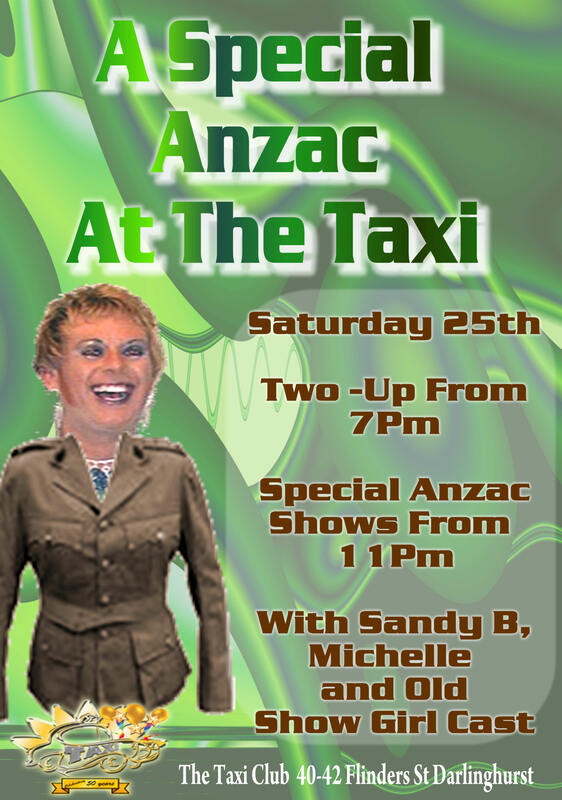 Dont forget if your around on the 25th of April to drop into the Taxi Club as there is a special Anzac Day show on from 7pm with Two Up and shows from 11.30Pm with a all showgirl cast.